A vegetated swale is a broad, shallow channel with dense vegetation covering the side slopes and bottom. The vegetation in the channel provides filtration and solids removal and reduces stormwater flow velocities as the flow is conveyed through the system. Vegetated swales (also known as grassy swales or biofiltration swales) are flow-based systems sized to treat the water quality flow rate. The treatment effectiveness is correlated to the residence time of the runoff in the swale. 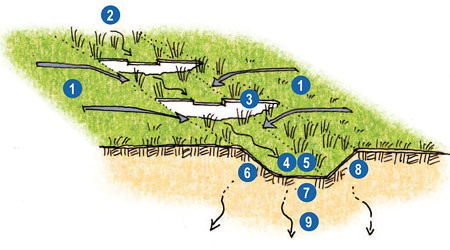 Depending on the native soils, some infiltration may also occur, which decreases runoff volume and provides additional filtering. Vegetated swales can be well suited to treat runoff from roads and highways because of their linear nature. Swales can be paired with many other treatment measures, such as rain gardens and infiltration basins. Swales are highly customizable and can include amended soils or sub-surface infiltration trenches. Improves water quality by removing sediment, particulate matter, and trace metals. Can create habitat and increases biodiversity in the city. Infiltration of runoff improves urban hydrology and facilitates groundwater recharge. Limited volume reduction and peak flow attenuation unless designed as a dry bio-infiltration swale. Impractical in areas with very flat or very steep topography or with erosive or poorly drained soils. Little removal of dissolved pollutants and bacteria. Poor pollutant removal and vulnerable to erosion when flow velocities are high. Limited to relatively small drainage areas. Swales are typically installed by major new development or as part of corridor-wide improvements. They require complex engineering and take up a larger surface area, and are generally not installed in streets by individual small property owners, tenants, or business owners. They may be built as a standalone LID feature, or in coordination with other streetscape and LID features, such as bioretention planters (rain gardens), infiltration trenches or permeable paving, as part of block- or neighborhood-scale projects. At a minimum, swales located in the sidewalk area require a Sidewalk Landscape Permit from DPW. A Sidewalk Landscape Permit grants permission to replace concrete sidewalk with landscaping. Swales constructed in the roadway, medians, or other areas, would require other permits. The project sponsor must obtain relevant permits for all LID and streetscape features. Generally, DPW will combine multiple features into a single permit. See Permit Process for more information. Swales may be used on many street types with long, unconstrained areas, such as within medians or in the furnishings zone of streets with unbroken curb edges, such as streets without parking lanes or many driveways. Frequent driveway curb cuts, pedestrian paths accessing the parking lane, and sub-surface utilities diminish the appropriateness of installing a swale. Swales can be connected with other stormwater facilities such as rain gardens to provide pre-treatment. Similarly, on parkways and other streets with adjacent open space, natural swales can treat and delay runoff before it is directed to a larger stormwater management facility or the city sewer network. Soils: It is possible to install swales on virtually all soil types, but proper routing and design require a full understanding of local soil topography and climatic conditions. Vegetated swales are most effective on soils that allow infiltration. If infiltration is desired, the underlying soil drainage rate should exceed 0.5 inches per hour. Amended topsoil can be installed to improve infiltration and retention of runoff. With appropriately amended soils, a vegetated swale can be combined with a sub-surface infiltration trench. Where good infiltration rates exist, swales can be used in conjunction with sub-surface infiltration trenches to further reduce both runoff volumes and peak discharge rates. In some cases swales can be installed on top of impermeable soils by excavating the native soil and replacing it with a layer of well-drained planting medium and an underdrain. Soils that consist mainly of gravels and coarse sands may also be problematic if they cannot support dense enough vegetation growth to adequately treat runoff. If there is a concern about groundwater contamination in an area with coarse soils, the swale may be lined. Drainage area and slope: Swales can be used to treat runoff from small drainage areas with up to 5 acres of impervious surface. Swales are best used on sites with relatively flat slopes. Larger drainage areas and steeper slopes result in flow velocities that are too high to allow adequate treatment and may cause erosion of the swale bottom and side slopes. The recommended longitudinal slope for swales is typically between 1% and 6%, with a slope around 2% being preferred. Limiting the longitudinal slope helps maintain a low flow velocity. Check dams can be installed in swales to promote additional infiltration and should be used if the longitudinal slope exceeds 5%. Setbacks: For setback requirements, see the Stormwater Design Guidelines, Appendix A. Depth to groundwater:There should be at least 4 feet of separation between the bottom of the swale and the water table. Dimensions and Sizing: Swales should generally have a trapezoidal shape with a flat bottom (in the direction perpendicular to flow) to promote even flow across the whole width of the swale. Swales should have shallow side slopes and depth to avoid safety risks and prevent erosion. The preferred width for swales is 5 to 11 feet. Swales as narrow as 3 feet may be appropriate. For more details on swale dimensions and sizing swales appropriately, see the Stormwater Design Guidelines, Appendix A.
Vegetation: A dense vegetative cover on the swale bottom and side slopes filters pollutants out of runoff and helps reduce flow velocities and protect the swale from erosion. Fine, close-growing grasses are ideal because increasing the surface area of the vegetation exposed to runoff improves the effectiveness of the swale. Native wildflowers and ground covers can also be used. Vegetation that can tolerate both wet and dry conditions as well as accumulations of sediment and debris are best-suited for swales. For more details on swale vegetation, see Stormwater Design Guidelines, Appendix A. Examples of specific types of vegetation appropriate for swales can be found in the Stormwater Design Guidelines Vegetation Palette, Appendix D.
Design details: For swale slopes over 6%, check dams should be provided. Check dams should be constructed of durable, non-toxic materials such as rock, brick, concrete, or soil by integrating them into the grading of the swale. Swales may be incorporated into the urban setting by incorporating hard vertical edges to create a formal edge or raised safety border. Flush ribbon curbs on the street edge of a swale or evenly spaced small curb cuts into the existing raised curb should be used to allow roadway runoff to enter swales. Amended topsoil should be installed to improve infiltration and retention of runoff. With appropriately amended soils, a vegetated swale can be combined with a sub-surface infiltration trench. Where good infiltration rates exist, swales should be used in conjunction with sub-surface infiltration trenches to further reduce both runoff volumes and peak discharge rates. In locations where there is low soil permeability, an underdrain should be used. Where swales are installed in medians, the adjacent roadway should be graded and crowned to drain toward the median swale to maximize runoff capture. Accessibility: Where there is a vertical drop between the sidewalk and the rain garden, a 4-inch lip must be provided at the edge of the facility for tactile detection. Landscaping: Swales in the sidewalk should follow landscaping clearances and guidelines for sidewalk landscaping. As an alternative to exposed landscape stormwater facilities, segments of sidewalks or reconstructed curb extensions may be retrofitted with durable boardwalks to serve as clear pedestrian throughways integrated with stormwater management. Raised boardwalks may be placed over exposed drainage rock or amended engineered soils to allow stormwater to pass beneath a walking surface for temporary storage or infiltration into the soils below. A boardwalk creates an exposed soil or gravel infiltration trench beneath the sidewalk that effectively reduces impervious surface area and provide opportunities to clean and infiltrate runoff from the public right-of-way, without losing valuable pedestrian space. Boardwalks can add interesting diversity of color, texture and material to the sidewalk and create possibilities for landscaping or educational uses. Boardwalks are best suited for flat streets. Infiltration boardwalks should be used in the furnishings or extension zones, outside of corners and other crossing areas. The throughway and frontage zones are not appropriate for this treatment. Infiltration boardwalks should not be used adjacent to curbs that serve as transit stops. Boardwalks may continuously cover infiltration areas or sections of boardwalk can be removed and infiltration areas may be planted with rushes or grasses, resulting in a bioretention planter (rain garden). Boardwalks should be flush with existing sidewalk level and covered with an ADA-compliant walkable surface to reduce tripping hazards and maintain a sense of one continuous pedestrian realm. Boardwalks should have accessible surfaces with gaps of no more than 1/4 inch. They may use a distinct paving material from the rest of the sidewalk. Similar to bioretention facilities, facilities placed in series would allow overflow from one infiltration area to be captured by the following during larger rain events, with an ultimate outflow to the nearest catch basin. Sign poles, utility access panels, and pedestrian amenities may all be maintained within the boardwalk area with appropriate clearances. If properly designed and regularly maintained, vegetated swales can last indefinitely. Pre-treatment designed to remove trash and coarse sediment will reduce the maintenance burden for the swale itself. The primary maintenance objective for vegetated swales is to maintain the hydraulic and removal efficiency of the channel with a dense, healthy vegetative cover. During construction, it is important to stabilize the swale before the vegetation has been established, either with a temporary grass cover or the use of natural or synthetic erosion control products. Plant health must be maintained with appropriate pruning, watering, and other care as needed. The permit holder must ensure that planting does not encroach into the accessible path, throughway zone and into courtesy strip. Trees in the sidewalk must be pruned to maintain 80 inch minimum clearance above sidewalk.